NEW BRITAIN - After three weeks of running Connecticut’s largest amateur multi-sport event, Nutmeg Games executive director Patrick Fisher can finally catch up on some much-needed sleep. The 30th annual Nutmeg Games are officially closed. This year, there were a total of 7,000 athletes ranging from age 5 to 86, 293 teams and 578 sports games including archery, baseball and softball, basketball, cycling, field hockey, track and field and many more. The one sport that drew the most attention was track and field. 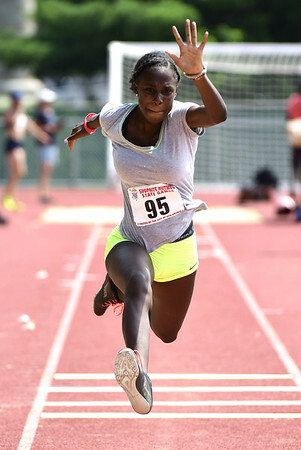 For years the events have drawn in hundreds of athletes from the region and this year was no exception, bringing in more than 600 athletes of all ages. It also helps that the Games have plenty of venues to use in the city throughout its weeks of competition, including New Britain High School, Stanley Golf Course, CCSU, Beehive Stadium, Veterans Stadium and Slade Middle School; and local parks including Chesley Park, Martha Hart Park, Hungerford Park and Walnut Hill Park. Events were also held in surrounding towns such as Newington, Berlin, Plainville, Meriden, Wallingford and Danbury. Among the facilities used were Sage Park, ClemLemire Recreation Complex, Newington Ice Arena, the Basketball House, Falcon BMX, Blue Trail Range, Candlewood Center, Wesleyan University and Trinity College. The Nutmeg State Games’ mission is to promote and reinforce the Olympic spirit of competition that values sportsmanship, effort and achievement; and to provide a forum that initiates and encourages camaraderie between different ages, socioeconomic and cultural groups through athletic competition and fair play. That spirit, which leads to the athletes receiving their medals, is what Fisher enjoys the most. “I get notified when every time someone tags us or posts a photo of the medal presentations, and just seeing the smile on the kids’ faces, it’s my favorite part,” Fisher said. In all, 1,162 medals were awarded, with the North region collecting the most with 366 - 143 gold medals, 124 silver and 99 bronze. When running such a large competition, there is always the possibility of issues popping up. But not so for this year’s Games, Fisher said. But that doesn’t mean the staff running the Nutmeg Games doesn’t try to improve the events every year. Posted in The Bristol Press, General Sports on Tuesday, 7 August 2018 20:55. Updated: Tuesday, 7 August 2018 21:00.